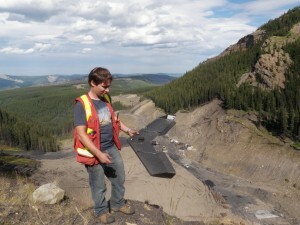 Hey guys, I am pleased to announce that West Coast Placer is starting a mining club. There have been a number of inquiries from people who want to prospect and mine on WCP claims. So we’re starting a club that will provide the opportunity for members to use our claims. Club members will have access to all of West Coast Placer’s claims. Currently that includes 12 placer claims and two mineral claims in BC. Access to some of my partner’s claims is also available. We have claims all over BC including the Tulameen, Similkameen, Fraser River, Cariboo and Kootenays. Members will be able to work the claims as if they own them. You can run a sluice, pans or whatever you want. Of course members can keep all the gold that they find. You will be able to camp on the claims in tents or with an RV (where accessible). Family members are automatically included in your membership. Gold panning is a great activity for the whole family, kids love it. You can bring your friends too, the more the merrier. There are a few obligations that will have to be met. The first rule of prospecting club is you do not talk about prospecting club. Just kidding I had to throw that in there. 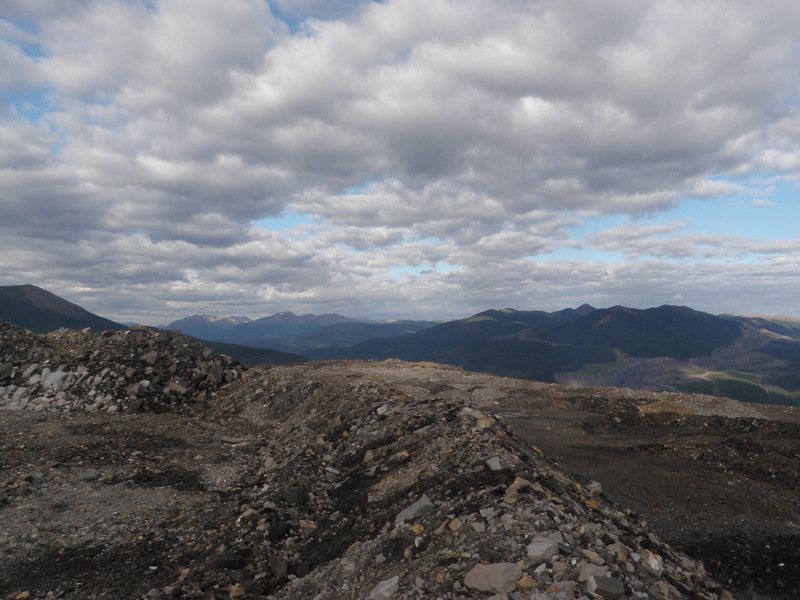 Members must follow all the regulations regarding placer mining in BC. If you don’t know all the regs don’t worry, information will be provided. Activities will have to be recorded. This will help with our reports to the MTO. It’s not much work, just keep some notes on the work that you do. Keep track of things like, hours spent working, size and location of holes, and take pictures. This information will also be shared with the group. If you plan on running a sluice or highbanker you will need to have a Free Miner’s Certificate. If you need help getting one, just ask. There will be an annual fee of $50. Why a fee? That is required to limit club membership to people who are truly interested. $50 is pretty much free compared to similar clubs. The others are looking for $300 and up. We’re not interested in making money off of memberships. As a member you will also have the opportunity for instruction in the art of gold prospecting. This is great for novice miners. You can join myself and more experienced members on prospecting trips. That is the best way to learn, you can watch youtube videos and read books all day but nothing beats hands on training. Members will have support from experienced miners. You can even get help with your own MTO reports for your own personal claims. You can ask advice at any time and we’ll try our best to get back to you as soon as possible. As a member you will be entitled to a discount on the purchase any of West Coast Placer’s claims. There will be more perks as the club grows. If you are interested please send an email through the WCP contact form on this link, Contact Form. Please share any suggestions or comments that you might have. Mining under Earth’s oceans is just starting to happen. We have gotten pretty good at mining deposits that are accessible by land but 71% of the Earth’s surface is covered by water. To date no large scale mining operation has succeed under the ocean which means that it’s all virgin ground. Amazingly the human race has spent more time and money exploring outer space than we have under our own oceans. Over 500 people have been to space while only three have ventured to the deepest part of the ocean, the Mariana Trench. We have better maps of the surface of Mars than the bottom of the ocean, although the ocean maps are pretty cool. The same geological processes that happen on land also take place under the ocean. There are volcanoes, mountain chains, faults and earthquakes. All the same types of mineral deposits occur under the ocean such as epithermal gold, porphyry, and placer. 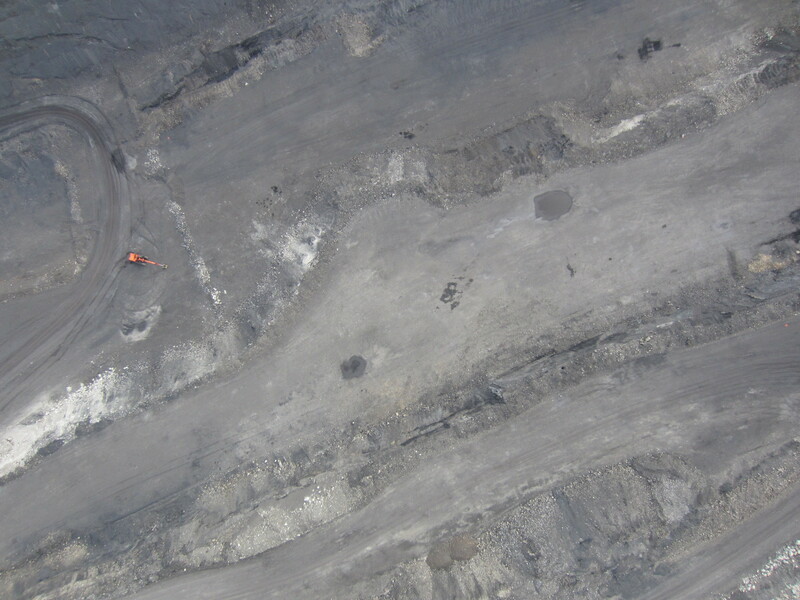 There are also diamond pipes, massive sulphides and everything else that we mine at the surface. The ocean also has types of deposits that we can’t find on land. One special mineral deposit is called Polymetallic Nodules. These are concretions of metallic minerals that occur under the ocean. The nodules grow sort of like stalactites do in a cave, over time layers of metallic minerals precipitate out of seawater and add to the nodule. The growth of nodules is one of the slowest known geological processes taking place at a rate of one centimetre over several million years. Polymetallic nodules are roughly the size and shape of a potato and contain primarily manganese as well as nickel, copper, cobalt and iron. They can be found on the sea floor or buried in the sediment. Nodules can technically occur anywhere in the ocean but seem to be in greatest abundance on the abyssal planes around 5000m deep. Nodule mining would be similar to placer gold mining except under water. Anouther resource that is unique to the ocean floor is Ferromanganese Crusts. These are similar to nodules but occur as a coating on other rocks. These crusts can be found all over the ocean with thicknesses ranging from 1mm to 26cm. Ferromanganese crusts typically occur in the vicinity of underwater volcanoes called seamounts or near hydrothermal vents. Crusts with mineral grades that are of economic interest are commonly found at depths between 800m and 2500m. Ferromanganese crusts are composed primarily of iron and manganese, hence the name. Typical concentrations are about 18% iron and 21% manganese. Cobalt, Nickel and Copper occur in significant quantities as well. Rare earth metals such as Tellurium and Yttrium can be found in metallic crusts at much higher concentrations than can be found on the surface. Tellurium is used in solar panels and is quite valuable. Sea-floor massive sulphides (SMS) are a younger version of volcanic massive sulphides (VMS). The two deposits are similar except that VMS are typically ancient and SMS are currently forming. SMS deposits occur where superheated hydrothermal fluids are expelled into the ocean. 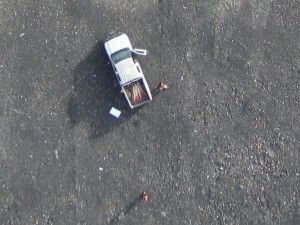 They typically form around black smokers near continental rift zones. SMS are know to hold economic concentrations of Gold, Copper, Silver, Lead, Nickel and Zinc. Black smokers create SMS deposits by expelling superheated sea water that is rich in metallic elements. Cold sea water is forced through the sea floor by the pressure created from the weight of the water column above it. The water is then heated to temperatures in excess of 600°C when it is brought close to the magma that lies below. The heated water becomes acitic and carries with it a high concentration of metals pulled from the surrounding rocks. Once the hot, metal rich, water comes into contact with cold sea water the metals crystallize and deposit on and around the black smoker. Large scale ocean floor mining has not taken off yet. Attempts have been made since the 1960s and 70s but failed due to technological and financial challenges. Small scale shallow ocean mining has been a lot more succesful in recent years. A great example is the popular TV show Bering Sea Gold. The miners in Nome Alaska are using modified suction dredges to comb the sea floor in shallow waters. Currently proposed sea floor mining ideas are essentially super high-tech placer mining. They involve ways to dig through the surface layers of the ocean floor, bring the material to the surface and ship it to a processing facility. Its a lot like dredging but on a massive scale. As mentioned above, normal hard rock deposits also occur under the ocean but no plans have been proposed to build open pit mines under the ocean. That would involve all the challenges of building a mine on land with the added complexity of operating under the ocean. Why is ocean floor mining possible now when it wasn’t 20 years ago? The answer comes down to one word, robots. The world of under water mining is the domain of autonomous drones and human controlled ROVs. Robot submarines are nothing new, they have been around since the 70s and have been used to explore depths of the ocean that are very difficult for humans to get to. UUVs or unmanned underwater vehicles are a little bit newer, they are basically an autonomous version of ROVs. Ocean mining robots have just been invented and share a lot of the technology used in these devices and they look like something straight out of science fiction. The first deep sea mining project is currently being developed off the coast of Papua New Guinea. The project is called Solwara 1 and is being developed by a Vancouver BC mining company called Nautilus Minerals. Solwara 1 is a copper/gold SMS deposit with estimated copper grades of 7% and gold grades in excess of 20g/t and an average gold grade of 6g/t. The property sits at about 1600m depth. Nautilus has developed a suite of underwater mining robots and a complete system to mine the precious metal and bring it to shore. There will be the bulk cutter pictured above, an auxiliary and a collection machine. Please take a moment and marvel at these amazing achievements of engineering. The Riser and Lifting System (RALS) is designed to lift the mineralised material to the Production Support Vessel (PSV) using a Subsea Slurry Lift Pump (SSLP) and a vertical riser system. The seawater/rock is delivered into the SSLP at the base of the riser, where it is pumped to the surface via a gravity tensioned riser suspended from the PSV. Once aboard the Production Support Vessel the mined slurry will be dewatered and stored until anouther ship comes to take the material on shore for processing. The removed sea water is pumped back down the RALS which adds hydraulic power to the system. Pretty cool stuff! Check out the video below for an visual explanation of how it will all work. Ocean floor prospecting is not a good place to be gold panning or hiking around with a rock hammer. It is also difficult to take usable photos due to poor light and lots of debris in the water. So how do you explore for minerals in the ocean? 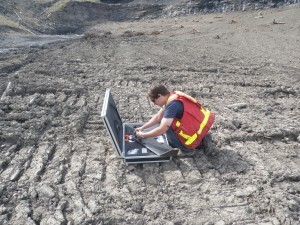 Geophysics and robots. Geophysical exploration is not unique to the ocean. 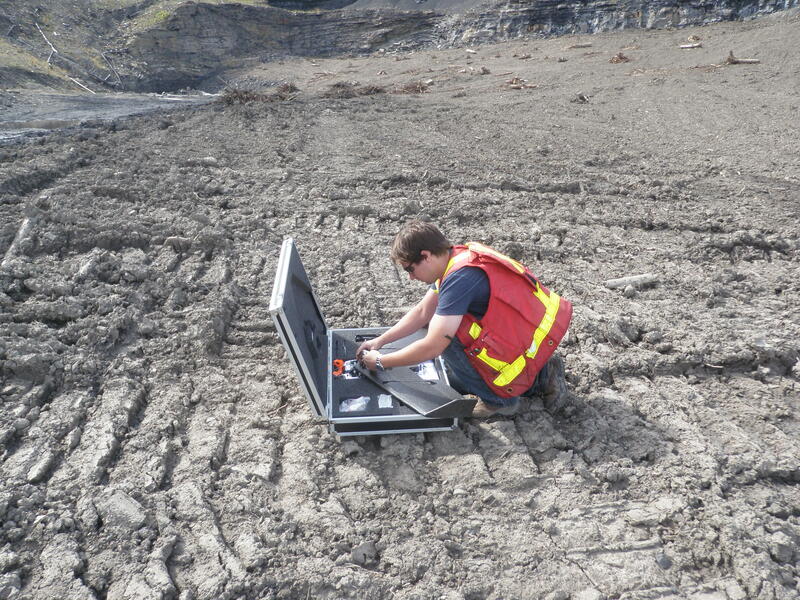 The same techniques are used routinely on land to find every type of mineral deposit. Ocean geophysics is also not new. 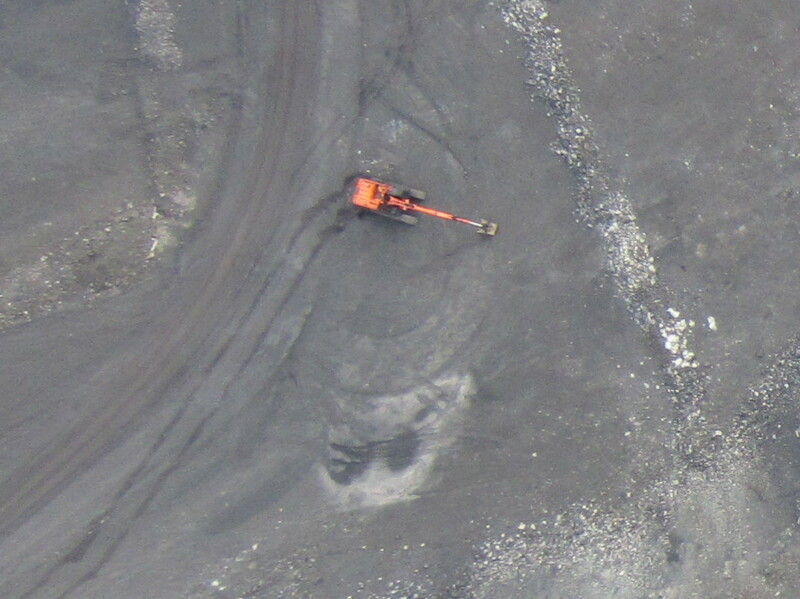 The main workhorse of mining exploration is magnetometry. Which means mapping changes in earth’s magnetic field using a specialized sensor. The technique was actually developed to detect enemy submarines during World War II. Since then magnetometers and the science behind them have evolved into accurate tools to measure geology. I’m using a proton precession magnetometer in the photo below. There is some sample magnetometer data on the left. Mag maps look similar to a thermal image except the colour scale represents magnetic field changes (measured in nanoTesla) instead of temperature. Magnetometers are excellent tools for ocean mining exploration. They are not affected by the water and are excellent at detecting metallic anomalies. There are now underwater drones that can collect ocean magnetometer surveys without the need for human intervention. Other geophysical techniques have been used in ocean mineral exploration. Electomagnetics (EM) techniques are also great tools for exploration under water. EM works in a similar way to magnetometry except that they emit their own source. Conventional metal detectors are actually a small version of an EM system. While mag passively measures Earth’s magnetic field EM measures the difference between a source and received pulse. EM also works great for discovering metallic anomalies and is being incorporated into autonomous drones as well. There are other types of ocean geophysics such as seismic refraction which uses a giant air gun to send a sound wave deep into the crust and measures the response on floating hydrophones. 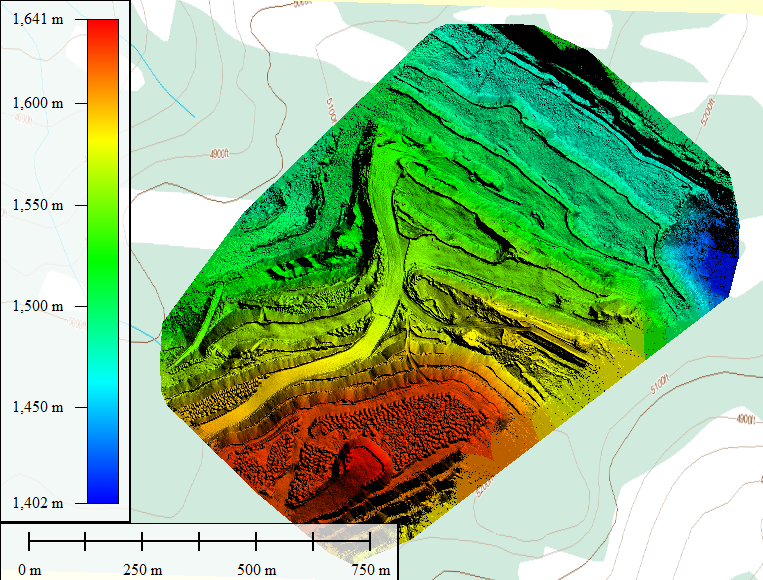 Sonar and other forms of bathymetry can provide detailed maps of the ocean floor. 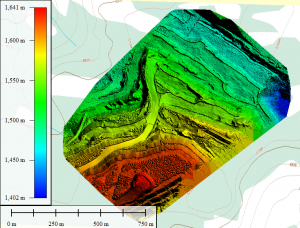 Bathymetry techniques can create imagery similar to LiDAR that is used on land. Ocean mining is just in its infancy and some really cool technology is being used. Advancements in the robotics have allowed mining and exploration to be completed without a person having into enter the water. As technology advances further we will be able to explore vast areas of the ocean floor and discover immense mineral reserves that are presently unknown. It is estimated that we have only explored about 5% of the ocean floor, who knows what we’ll find down there? Is the world running out of gold? That seems to be a common theme in investment circles in recent years. This eye catching article on Visual Capitalist estimates that we’ll be out of gold by 2030. This article based on a report from Goldman Sachs claims we’d hit “peak gold” in 2015, GoldCore. Peak gold is the same idea as peak oil. Where the peak is the moment when maximum world production is reached and declines from then on, eventually reaching zero production. Unlike oil though gold is not used up in consumption. It is typically stashed away in a vault or worn as jewellery. Estimates for all the gold in the world mined to date hover around 165,000 metric tons. Some estimates go as high as 1 million tons but most experts would agree that under 200,000 is accurate. World gold supplies are difficult to quantify. That is because gold reserves are not always reported accurately. Over 50% of gold above ground is used for jewellery which makes it difficult to track. Gold rings, necklaces and such can change hands without any records. About 35% is stored as bullion for investments and reserves. Large holders of gold give misleading numbers regarding their reserves, presumably for security reasons but who knows? The United States, Germany, Italy and France are the worlds largest holders of gold respectively. Each has their share of controversy surrounding their claimed gold deposits. There are conspiracy theories about the amount of gold stored in Fort Knox. Some believe it is empty and the government is just pretending its full of gold. Without seeing it for ourselves we’ll just have to accept the disclosed numbers. To further add uncertainty to global gold production small scale miners do not typically report their take. This is especially true in third world countries. A lot of gold is mined in this way, primarily placer but hard rock as well. How much gold is left in the ground? Nobody really knows. Mining companies of all sizes spend their exploration budget to map out potential deposits. They are a long ways from mapping the entire earth. 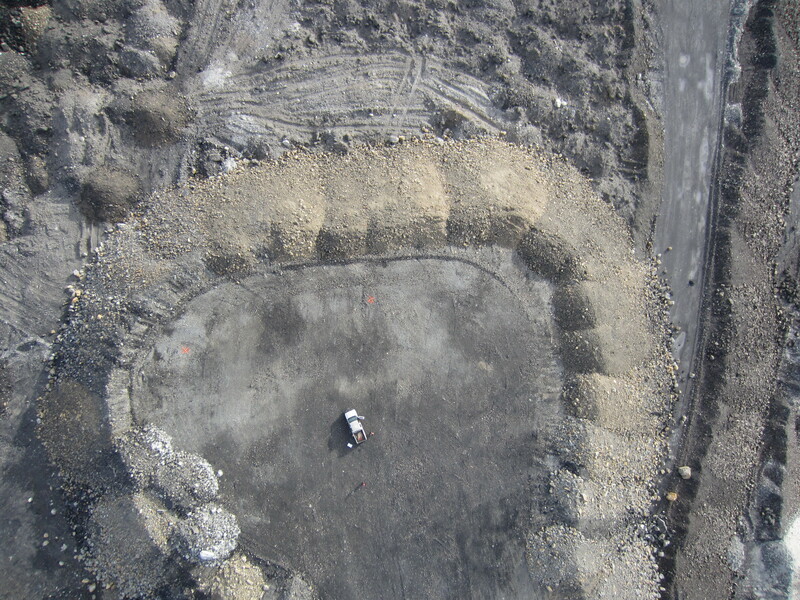 The peak gold estimates are based on proven and indicated reserves that are reported by public mining companies. There is no shortage of gold on earth. The problem is that it is much deeper than we can mine. Current scientific theories estimate that there is enough gold in the core to cover the surface of the earth with a 4 meter thick layer of pure gold. The density of the core is measured using several techniques including seismic geophysics. Seismic waves are measured from earthquakes all over the world. The wave properties change as they pass through the liquid outer core and the super dense inner core. S-waves can’t travel through liquid, that is how the outer core is mapped. The density of the inner core is greater than iron at 5,515 kg/m3. Clearly there are large amounts of substances that are heavier than iron to achieve that density. We are limited to several thousand meters below the surface as far as mining is concerned. Check out this blog post on the origins of gold. Lets do a little math. The average concentration of gold in Earth’s crust is estimated to be between 0.0011 ppm(source) and 0.0031 ppm(source). Now we can calculate the volume of the portion of the crust which can potentially be mined. The deepest gold mine in the World is TauTona Mine in South Africa which reaches 3.9 kilometers below ground. 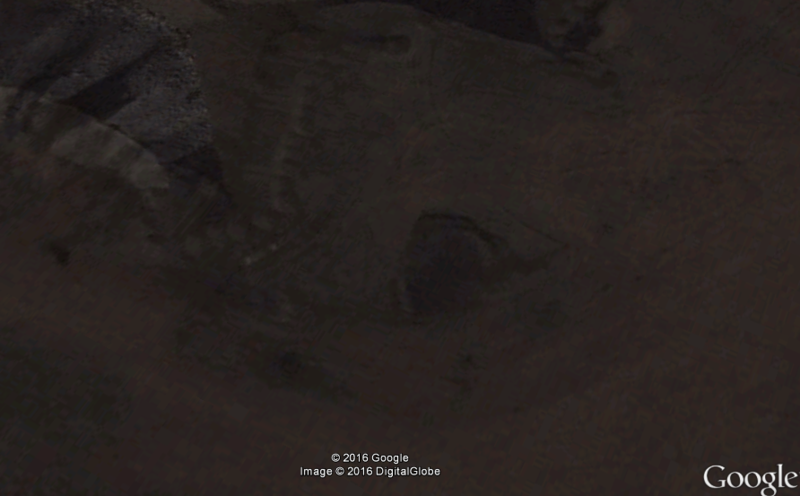 The TauTona mine, operated by AngloGold Ashanti, is a gold mine so its a good yard stick for how deep we can go. The volume of the earth (approximated as a sphere) is 1,086,832,411,937 cubic kilometres. The calculated volume for the earth with 4km stripped off the top is 1,084,788,886,213 km3. Subtracting the two and using the average abundance of 0.0031 ppm we arrive at 6.3 billion cubic meters of gold in the top 4km of the crust. One more calculation, gold has a known density of 19.3 tons per m3. Which gives us a total mass of 122,264,143,828 or 122 billion metric tons. That is a lot of gold. Our calculated estimate of 122 billion metric tons of theoretical gold includes the entire surface of the earth. Currently we are not equipped to mine the oceans, although technology is advancing quickly. Check out this article on sub-sea mining robots, LINK. The same processes that accumulate gold into deposits occur in the ocean just as they do on land. With 71% of the surface covered by ocean that is a significant area that is yet to be explored. Lets adjust our estimate to account for only continental land which can be mined with today’s technology. So by subtracting the oceans we are left with 35 billion tons of gold on dry land. Global production throughout the entirety of human history is 165,000 metric tons as previously mentioned. So in a very theoretical sense we have mined 0.00047% of the world’s surface gold. That’s very encouraging. Although not all of that gold is accumulated in mineable deposits. Typically you need at least 0.5 ppm to make a mine profitable. Depending on logistics, location, overburden and other factors that cut off grade can rise quite steeply. So all of that 35 billion tons is not really available to us. Once gold is discovered it will be mined. We are too greedy to leave it in the ground. Take a look at the gold rushes of North America between 1849-1900. There are some great blog posts on the subject here, Gold Rushes. The hoard of gold hungry prospectors would descend on a creek once a discovery was made. They would move in, erect a town and mine it for all its worth. Within 2-3 years all the easy gold is gone and only the tenacious miners would remain to mine the small gold. The rush would continue elsewhere and repeat the cycle. The same thing happens with hard rock mining but on a longer time scale. Peak gold takes this phenomena into account. Much like peak oil we’ve picked the low hanging fruit wherever it has been found. Gold is a little different because it is very hard to find. When it comes to oil reserves the big ones stick out like a sore thumb. Typically it takes about 20 years to go from discovery to full scale gold mine. 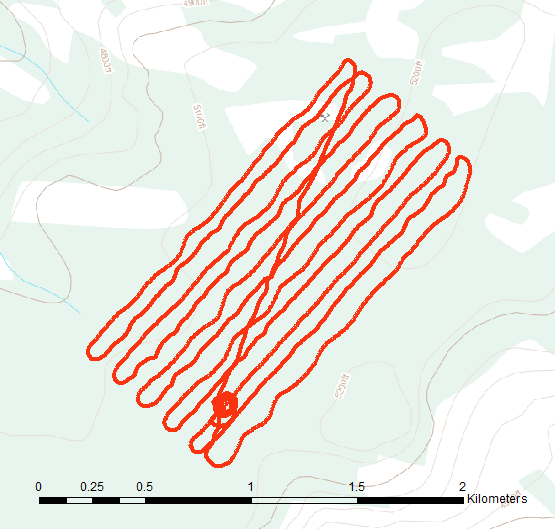 That involves all the steps to test a property using prospecting, geophysics, and diamond drilling. 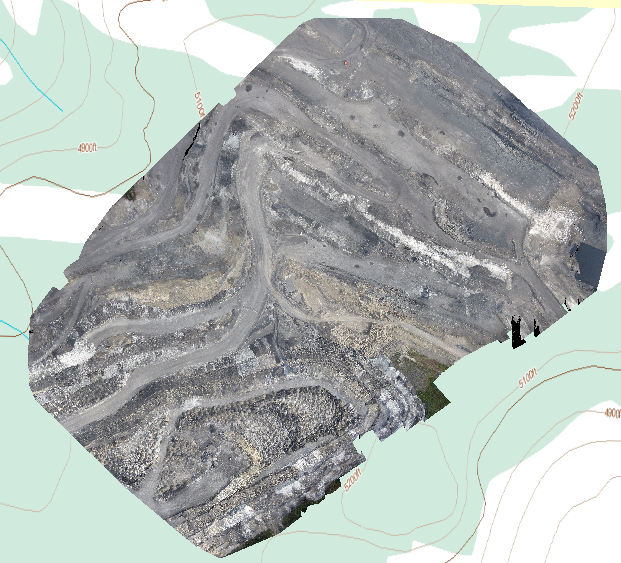 Delineating the reserve and all the stuff that it takes to build a modern mine (permits, studies, infrastructure and so on). With the current state of the mineral exploration that 20 year lead time is going to come back to bite us. Over the last few years mineral exploration has dropped off to the point that it is almost non-existent. That seems counter-intuitive if we are running out of gold. Exploration is a high risk investment and people don’t take the risk unless commodity prices are high. The good news is that when prices spike again like they did in 2010 there will be a massive feeding frenzy. So we’ve estimated that within 4000m of the surface of Earth’s crust there is 35 billion tons of gold. With a remaining 87 billion under the ocean. Only a small portion of that is concentrated enough to mine. Its a big world out there and we’ve only properly explored small pockets of it. The super easy stuff is largely gone but with advancements in technology and some ingenuity its there for the taking. For those explorers who are willing to put on their thinking cap and step outside of their comfort zone there is a bonanza waiting for us.